Please note that CERN is set to fire back up on Easter Sunday. Yes, the CERN project that is steeped in Illuminati symbols and actions, has chosen Resurrection day to start back up again. Interesting. New York is quite the center of the paganism and false gods. Let me remind everyone of a few other fun facts about New York's demonic enterprises in recent times. In April, part of the Temple of Baal that stood in Palmyra, Syria will be reconstructed in Times Square in New York City and in Trafalgar Square in London. The specific portion that is being erected in both cases is the 48-foot-tall arch that stood at the entrance to the temple. The Institute of Digital Archaeology is the organization behind this effort, and the display of these two arches is intended to be the highlight of UNESCO’s World Heritage Week late next month. After seeing my initial story, one of my readers observed that an arch is really just a gateway or a portal. In other words, it can serve as both an entrance and an exit. 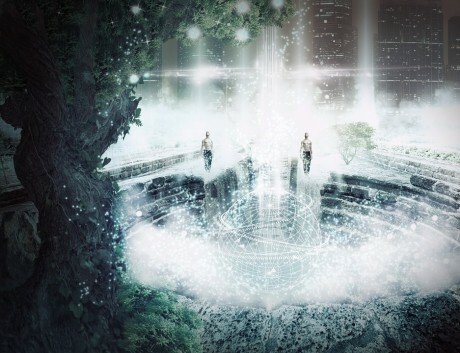 So could it be possible that we will be unknowingly setting up a gate or a portal of some sort in Times Square? Marduk, in Mesopotamian religion, the chief god of the city of Babylon and the national god of Babylonia; as such, he was eventually called simply Bel, or Lord. Originally, he seems to have been a god of thunderstorms. A poem, known as Enuma elish and dating from the reign of Nebuchadrezzar I (1124–03 bce), relates Marduk’s rise to such preeminence that he was the god of 50 names, each one that of a deity or of a divine attribute. After conquering the monster of primeval chaos, Tiamat, he became Lord of the Gods of Heaven and Earth. All nature, including man, owed its existence to him; the destiny of kingdoms and subjects was in his hands. The English Babylon comes from Greek Babylṓn (Βαβυλών), a transliteration of the Akkadian Babili. The Babylonian name in the early 2nd millennium BC had been Babilli or Babilla, which appears to be an adaption of an unknown original non-Semitic placename. By the 1st millennium BC, it had changed to Babili under the influence of the folk etymology which traced it to bāb-ili (“Gate of God” or “Gateway of the God“).